Successfully Added Multi Color LED Ice Bucket to your Shopping Cart. Enhance your evening with this multi-color LED ice bucket. Chill wines, champagnes, beers, and even non alcoholic beverages. Whatever beverage you want cold, this baby will keep it cool, and do it in dazzling colored LED style! The stunning color effect will leave you dazzled. The G172 provides smooth transition from one color to the next providing you with an ambient atmosphere of which you have not seen the likes of, till now. This LED color changing ice bucket emits Red, Orange, Green, Blue and Purple. With the transition effect, you'll see different shades of each color as the LED light changes from one color to another. In addition, while the LED ice bucket does its thing, you can simply press the select color button to stop the colors from changing. This model G172 is designed in size to hold one standard size bottle of champagne or wine plus ice. If you own a restaurant and want to really make your bar area stand out? Well then is LED ice bucket is what you need. The multi-color LED ice bucket can be used in a single static (fixed) color or color changing Mode. 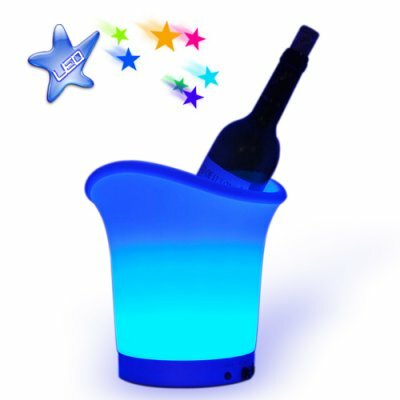 Make your bar area shine with this one of a kind LED color changing bucket brought to you by Chinavasion Electronics. In stock and available for bulk quantity orders, get yours today and be ready to impress people in time for your next big hosted event. You can clean the inside and outside of the bucket with a damp cloth. You should always keep the base dry. Never submerge this unit in water. on 2012-11-11 09:19:19 They are a wonderful item. When people see my ice bucket they want one. Would buy them as presents for friends.